Guys… it is almost “That time of the year”. You know.. time to dust off the old Elf on the Shelf and start brainstorming clever ideas for him to perform. While he is tons of fun and gives the kids something to look forward to everyday sometimes it is tiring coming up with cute ideas. But, have no fear, we are bringing you some printables that make it easy for you to set up fun scenes for one of your favorite North Pole Visitors. 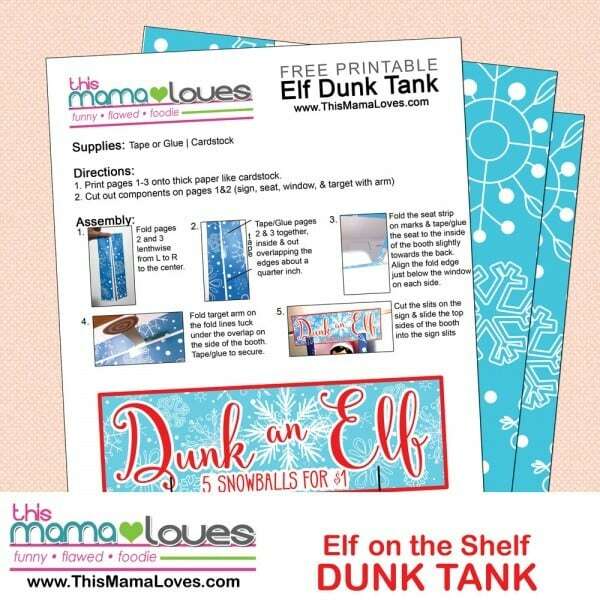 This FREE printable we are sharing with you today is an Elf on the Shelf Dunk Tank… all you need is tape, card stock, a pair of scissors, some mini marshmallows and of course your Scout Elf! Just make sure you are stealth and print this when the kids are at school or you are at work- you don’t want any littles finding these! The printable dunk tank is super easy to put together and the directions print right out with it. 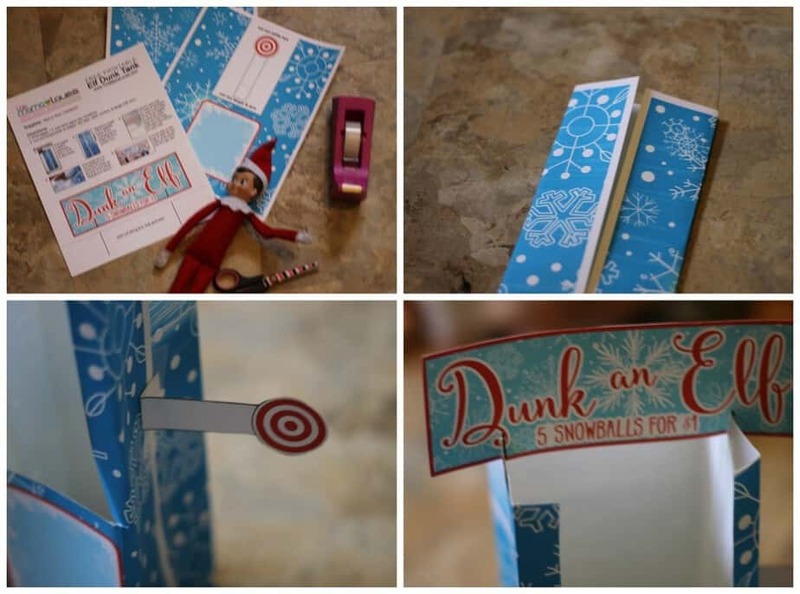 Just cut along designated lines, fold the two sides of the booth, tape together inside and out to secure, then tape the bullseye to the side, and pop the Dunk an Elf sign on top. Download the Printable Dunk Tank pdf right here- or click on the image below. I sat my Elf on a can and taped him to keep him in place. 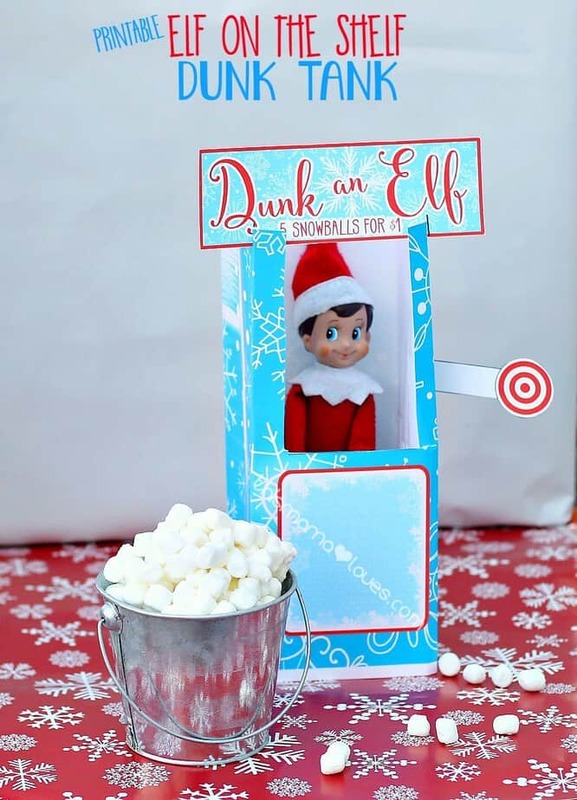 He WILL sit on the paper bench included with the dunk tank, but if you feel like you want a little more support, just slip something under the ‘bench’ to give your elf a little more support so you don’t come down in the morning to a toppled scout elf and a mini marshmallow explosion! Ta-Da! Your fave Scout Elf has a whole new way to cause some mischief, and get some giggles out of the kiddos. Wait till you see what we have coming next week! 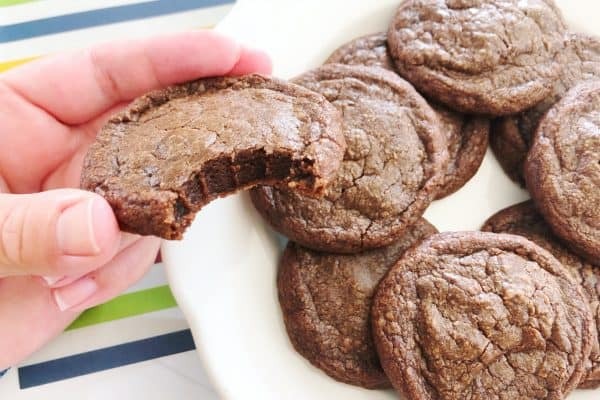 In the meantime, check out how to make Elf on the Shelf Cookies!! Love this Elf Dunk Tank! Would you be able to email me your kissing booth printable? Thanks a lot! Is the Kissing booth still availabe? How can I get it? Is your kissing booth printable still available, I would love a copy! Thanks for all your great ideas and wonderful printables!!! Ohhhh is there anyway I could get the kissing booth as well? My class would love it – we have Minecraft Jingle today! Making a little dunk tank for your toys seems like it could be a lot of fun. You are going to want to make sure that the toys used aren’t going to be ruined when they get dunked. Are elf on the shelf’s waterproof? I didn’t think they were, but if they are then they are perfect candidates! Could you please send me by email the kissing booth printout. Thank you. Hi! Can you also email me the kissing booth?! Thanks! I had pinned the kissing booth and now the link is just directing me to your home page. Is it not available anymore? It was adorable! They all are! Thanks! I have been trying to print the photo booth, dunk tank and massage table pdf. I cant get them to download. If you have the time could you please email them to me. Thank you Merry Christmas. Do you by chance have the file for an attachment? I tried 2 different browsers and it is blank also. Its so cute! I have been trying to print the photo booth, dunk tank and massage table pdf, but they are all coming up blank. Help please! 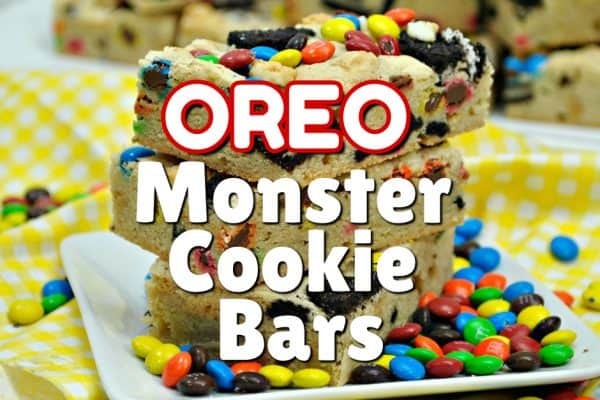 These are awesome & so very clever!! Thank you so much for any help ahead of time! They are working for me- what browser are you using? You have to click to open the attachment page then it should prompt you to download. Thank you for this wonderful idea for the Elf! I have been trying to print out the kissing booth template but it keeps coming up as page not found? Thank you! You have some fantastic ideas! My family appreciates your hard work! I love this! I’ve also pinned your kissing booth on Pinterest but when I try the link it says page not found. 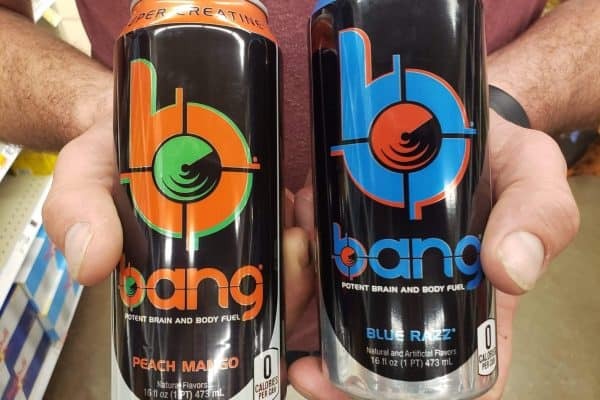 Is that printable no longer available? Kirby- please check your email. I am also unable to find the kissing booth, which looks adorable! I have been thinking about adapting a Elf for the shelf. I think it would be a fun and new thing to do. Its just too cute to not want to try. I love that you have printables! I was like how will I recreate this but I don’t have to cus there is printables! Red Red Fred and my Kids are going to love this! Pinning in my secret elf on the shelf board! I came over from The Inspire Me Monday link party! Thanks for the great idea!